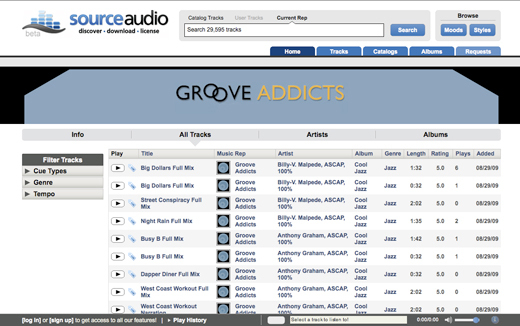 Groove Addicts is the 16th production music catalog to make their tracks available for license through Source Audio's online platform. With 29,595 tracks available right now, they have become the largest single catalog on the website, barely edging out Fuze Artz by just a few hundred songs. Source Audio's overall track total is now at 79,884 and we have plans to add a few hundred thousand more tracks in the not-too-distant future. « SourceAudio’s New Branded Experience!